Powers/Abilities: Due to the mystical forces channeled by the Gathering of the Five ceremony, Mattie Franklin possessed a number of spider-like and other powers, including superhuman strength, agility and speed. 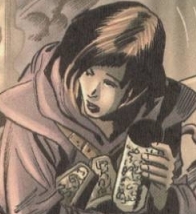 She could cling to surfaces, fly, had a precognitive spider-sense and limited telepathy, and could project psionic energy in the form of webs and an additional four spider-limbs. Whether she retained her powers or not was not revealed. (Spider-Girl#49 (fb)) <16 years before the main story> - As a teenager, Mattie took part in Norman Osborn's Gathering of the Five ritual; as a result, she was granted a number of spider-like superpowers. (Spider-Girl#40 (fb)) <15 years (approx.) before the main story> - After Jessica Drew's powers faded, she retired from heroics to become a private eye. The Spider-Woman identity was taken over by Julia Carpenter and (later) Mattie. (Spider-Girl#39 (fb - BTS)) - As Spider-Woman, Mattie used to contact Spider-Man by way of Peter Parker. Comments: Created by Tom DeFalco, Chris Batista, John Livesay. Mattie's costume can be seen in partial view on the front cover of Spider-Girl#60, as part of the montage of female heroes who inspire Spider-Girl. It has never been made clear if she was still active as a hero, or in any other way. She has only ever been seen in flashback. The timeline for the flashback events is based upon the fact that May Parker is about 16 years old, and Spider-Girl#49 establishes that as a new-born infant, she was returned to her parents on the same night that her father interrupted Norman Osborn's Gathering of the Five ceremony, where Mattie Franklin gained her Spider-Woman powers. Furthermore, Jessica Drew's retirement happened before she got married and had her son, Gerry, who must be about 13-14 at the time of the current stories.